Saying there is a lot to do in Red Dead Redemption 2 is a wild understatement of monumental proportion. With all the gunslinging, cattle rustling, horse trotting, bank robbing and general shenanigans of a typical outlaw cowboy to be done, there must be an opportunity for a little downtime once in a while, right? I mean, what good is the wild west without a saloon or two to occupy? We have gameplay footage of one such opportunity of reprieve as Arthur and Lenny ride into Valentine for just one or two drinks after a hectic day. Caution: The video below does contain spoilers! Red Dead Redemption 2 is has been met with massive acclaim across the board as the latest masterpiece from Rockstar Games. 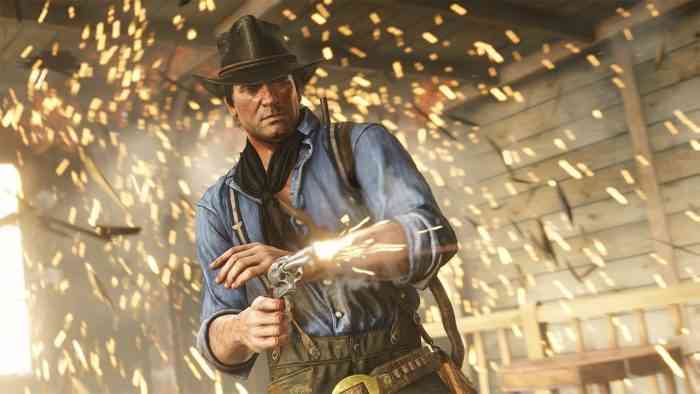 Players take on the role of Arthur Morgan, a member of the Van Der Linde gang as previously seen in the first Red Dead Redemption game. RDR2 is a prequel, telling the story of Arthur and the gang as he must make decisions that balance his moral compass and loyalty to the gang. The game offers a massive, sprawling open world with what feels like limitless possibilities of what to do. Players will have the freedom of decisions in this beautiful landscape and each choice will have its own immediate consequence. Have you been playing Red Dead Redemption 2 along with the millions of other gamers enjoying the wild west? Let us know your favorite missions, characters, and anything you love about the game on Facebook, Twitter, or the Comments section below. Red Dead Redemption 2 is out now on PlayStation 4 and Xbox One, for more information check out the game’s official website.